Due diligence is the extensive review of an asset or business after a buyer and seller have already come to a purchase agreement. Due diligence occurs after the intent-to-purchase has been signed but before the final contract is drafted and signed. The timing of due diligence is important to both the buyer and the seller. The intent-to-purchase is essential for the seller because the buyer is given access to internal sensitive information that the seller would otherwise not expose to a third party. It is vital for the buyer that due diligence is performed before the final contract is signed so that the buyer can uncover any factors that influence whether the purchase deal is a good decision or not. The buyer will should also ask why the seller wants to sell and whether this motive matches with the findings of the due diligence. Alternatively, due diligence is performed by the selling party instead of the buyer. This may occur when the seller wants to ensure that the buyer has all the necessary resources to fulfill the purchase deal. In case the purchase concerns a business then the seller might be checking what the possible intentions of the buyer are and whether the buyer can successfully continue the business. Due diligence is an extensive process because every aspect of the asset or business needs to be cross-checked against the information provided during the purchase negotiations. The usual time given for due diligence is 30 days. Finances are an obvious aspect to investigate. The investigating party, either the buyer or seller, looks into the financial history, current financial situation and the financial prospects. Aside from finances, the capital is assessed, employees reviewed and if it is a business then its corporate strategy and place within the market is looked into, as well. Due to the many technical details that need to be reviewed for due diligence, the process is usually conducted by a legal team and accountants. The only time due diligence is legally required is when the purchase dealing is between a broker and a buyer. The broker is responsible for checking the health of a business and informing the buyer of its condition. If the broker fails to do say then the broker may be liable for not disclosing vital information to the buyer. The checklist for due diligence is long which is why it is a time-consuming process. Due diligence is not legally mandatory but highly recommendable because it will prevent undesired surprises in the long run. 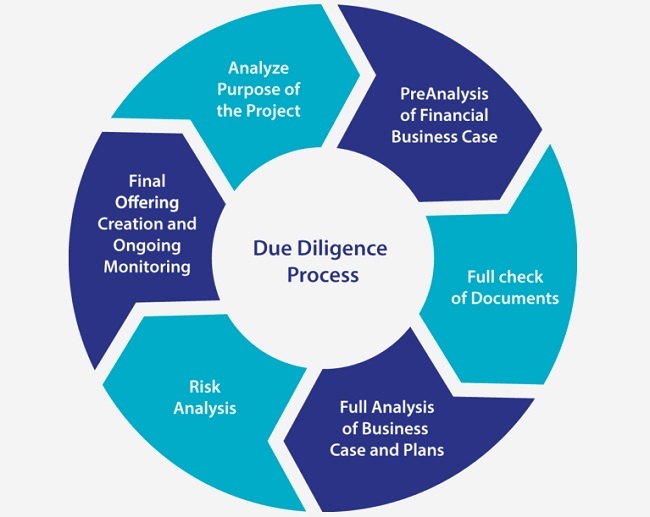 Below are the different aspects worth reviewing during due diligence. This list refers to the due diligence that needs to be conducted for the purchase of a business. Some of the aspects are transferable to other cases such as a real estate purchase or a merger but not all necessarily apply. Equally, this list is not exhaustive. The details of what needs to be analyzed for due diligence will depend on the specific situation. This is why the counsel of a legal team and accountants is essential in the proceedings. Checking the financial health of a business is one of the more time consuming components of due diligence. This is because the complete financial status of the business needs to be reviewed. Also, the review looks into the business’ financial history, usually for the last three years, its current financial situation and the projected financial status of the business. Is the accounting complete, correct and audited? Which accounts receivable are part of the deal and what is their condition? What is the sales pattern of the business and what are the sale projections? What is the profit margin? Is it optimal? Are there any debts or pending payments and how do they affect the finances of the business after the purchase? Are there any warranties and refunds that have not been completed yet? Does the business have adequate financial resources to bridge the due diligence and handover period? How liquid is the business? How efficient is its cash flow? What are the expenses of the business and are they reasonable? What are the assets of the business and what is its value? Legalities cannot be ignored when performing due diligence. This refers to whether the operations of the business are legally sound but also which legal requirements will transfer to the buyer after purchase. Are all the operations of the business legal? Does the business meet all the legal requirements such as health & safety laws etc.? Does the business have the necessary insurance? When does it expire and how does the insurance need to be adjusted after the purchase? Has the business paid all its taxes? Are there any pending payments? Is the tax history complete? Is the business involved in any litigation? Does the business have any technological or intellectual property? How is this arranged for in the purchase? How are the existing contracts of the business affected by the purchase? Are there any legal repercussions of the purchase of the business? Every business has an environmental responsibility. The buyer needs to check whether these responsibilities are met and how these responsibilities transfer to the buyer. Which aspects of operations has an environmental impact? Do these operations meet legal requirements and guidelines? How environmentally friendly is the business currently and how can this be improved? Have any environmental impact analyses been conducted and what was the outcome? How the business is organized in terms of employees and their role gives insight into the efficiency and potential of the business. The buyer should review the skills of the employees and their ties to the business. How is the business currently organized? Is it optimal? What are the skill sets of each individual employee and how do they contribute to the business? Which employees are essential for the running and success of the business? How likely are they to stay after the hand-over? What is the corporate or management culture? Are there any labor disputes? Under what terms do the current employees work including payment schedules, salary and benefits? What is the current Standard Operating Procedures (SOP) and is it still effective after the handover? Both the seller and the buyer should analyse the current position of the business in its industry and its potential for growth. This will be an important factor for the selling price.The seller is also responsible for finding out whether the buyer has the resources and experience to successfully continue the business. What does the market analysis mean for the future of the business? What is the current position of the business and how is this likely to change? What is the growth potential of the business? Which market trends affect the business and can the business adjust accordingly? How resilient is the business? What is its current sales strategy and marketing plan? Is it effective? How does the business compare to competitors? General running of a business is important in any industry. Effective operations are especially important when the business is a producer and reliant on suppliers. A service business is especially reliant on its employees and market trends. How is the business currently run? Is it effective and efficient? What are the terms of the current contracts with suppliers? Are the suppliers reliable? Is the business type and industry compatible with the buyer? What is the current location of the business? Is it a suitable location? Is the current property leased? What is the lease agreement and when does it expire? If the business is a multinational or functions as a digital office, does it meet all the local legal requirements, as well? What is the quality and value of the current equipment? Does the equipment need replacement? Is the equipment owned or leased? Will the equipment contract or ownership be transferred to the new buyer? What are its residual values? What is the current inventory and are the recordings correct? Does the stock expire? 1. Which of the following is not an important factor to be reviewed in due diligence? A. The motives of the seller. B. The color of the office space. C. The experience of the employees. 2. Why should the buyer request the seller’s financial records for due diligence? Can the buyer analyse the financial health through annual reports instead? A. The financial records show whether the business is effectively run and profitable. The financial records might also give insight into the seller’s motives. The annual report is not detailed enough for a complete review. B. The financial records show whether the business is effectively run and profitable. The financial records might also give insight into the seller’s motives. The annual report contains enough details for a financial analysis. C. Financial records are not provided for due diligence. The buyer needs to wait until the final contract has been signed to access the financial records. 3. Why should the buyer look into more than just the finances of the business? A. The success factors of a business depends on more than its profitability. The operations, staff and market outlook all play a role. The buyer needs to be aware of these factors to find out whether the purchase is compatible with the buyer. B. The success factors of a business depends on more than its profitability. The buyer should also look into the debts and liquidity of the business. C. The only requirement of due diligence is to check the finances. The buyer does not need to look beyond the financial health of the business.